It's exciting to watch mobile platforms evolve. Traditional computing has been at a mature product stage for a decade and there hasn't been a real revolution in desktop operating system design for some time. Apple, Microsoft, and Linux continue to incrementally improve. This is a good thing, since incremental changes are less likely to confuse users and send them into a fit of frustration. On the mobile front, it's an entirely different story. The rapid user interface (UI) developments have tapered off on mobile, yet there are likely many more UI (and hardware) improvements to come. iOS 7 was a big departure for Apple. Though it seems like an unsuspecting facelift, some major visual and under-the-hood changes were implemented, which indicates this is just the first step in a new direction. Android has also changed drastically, shape-shifting from a cartoony interface to a flat and modern design. The stock launcher has been replaced with the Google Experience Launcher (GEL) which debuted on the Nexus 5 phone. (Obviously, there are different versions of Android, as each original equipment manufacturer (OEM) modifies it with their custom user interface and software. Here, I will only focus on the stock version of Android, for Google's design implementations dictate app design direction). I want to make some comparisons between these two platforms, but first it's important to outline some of the more recent developments with Android. Defining Android used to be easy. On one end of the spectrum you had Google's offering. The stock version of Android (essentially AOSP) only came on the Nexus devices. On the other side of the spectrum are the various OEMs, which customize the UI and include their own proprietary mail clients, voice assistants, settings, etc. As Google began pushing their in-house apps (Chrome, Gmail, Search, etc) and bundling them on a variety of devices, stock Android has become more closed than open. Ron Amadeo outlined this trend in great detail in an Ars Technica article. The takeaway was Google has slowly been replacing the AOSP apps with it's own proprietary ones. As a result, the Nexus devices no longer run a version of Android that resembles AOSP. We now can divide Android into three categories: the Google experience, AOSP, and the OEM versions, with the latter option being further broken down by company. Google continues to lock down the platform in an effort to regain some control. In many respects, Google is managing Android like Apple manages iOS. AOSP will likely be "left behind" with regard to its built-in apps and visual style, and the Nexus 5 solidifies this trend. The new phone shipped with GEL and currently it's exclusive to that device. Though, I suspect we'll see GEL in the Play Store in short order. Google is now just another OEM, and this shift in strategy is deliberate. The only difference between Google and other OEMs is Google owns and controls the Play Store ecosystem, thereby allowing it to dictate the platform's direction. Clearly, Android and iOS are two very different platforms in terms of their look and feel. iOS 7 (as previously mentioned) was a big development for Apple. While the OS looks and feels much the same, its strength lies in its consistency and simplicity. Apple is very careful about its design choices. By comparison, Android has been a bit chaotic until recently, but Google's streamlining of the design has helped immensely, and both platforms are on relatively equal footing today. Yet, there are common design aspects between platforms, which indicates both Google and Apple have settled on some "best practices" for mobile design; many of the design aspects will remain the same, and it's my assertion that mobile is now at a mature stage. Android and iOS both have home screens. Apart from the persistent differences (Android's separate app drawer and widgets), the orientation and the users' spacial thinking have historically differed on each platform. Android used to have the main home screen in the middle, and the user could swipe left or right to access their content, where iOS' layout resembled a book - progressing from left to right. Now, Android has a similar home screen orientation to iOS; GEL has a very linear feel. I'm not sure why Google changed the home screen layout (except providing more access to Google Now). It's possible GEL's home screen orientation is designed to resemble iOS to facilitate easier switching between platforms. Though, having home screens with a more centred orientation or including a "revolving" scroll system is perhaps more flexible, a linear approach is about as simple as interfaces get. 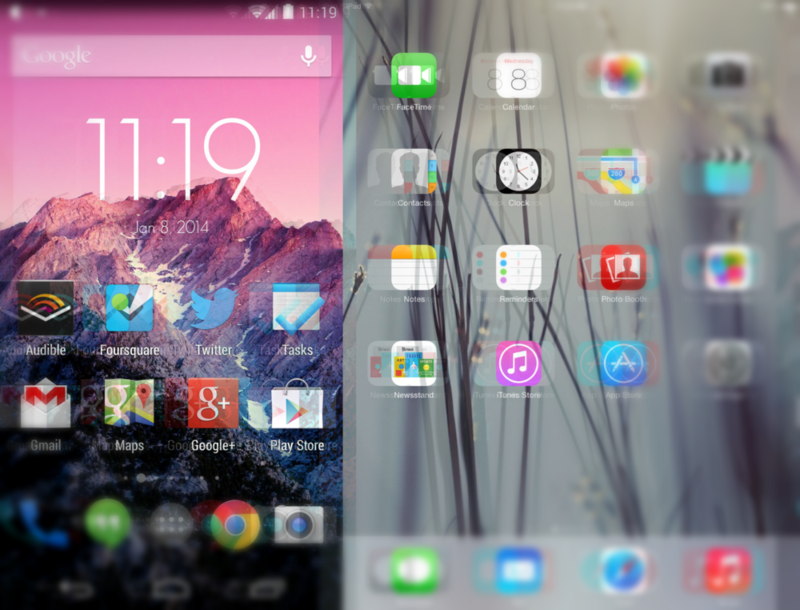 Right: Nexus 5 with GEL launcher. Left: Nexus 4 with the stock AOSP launcher. Notice the GEL launcher is much "softer" looking and incorporates the use of transparencies - eliminating contrast. The ever-present Google Search bar has been cemented at the top of the Android home screen for some time. It's a permanent reminder that Google powers this phone, and it's reminiscent of the Apple logo in OSX. Users can conduct searches right in the bar without opening the browser. Search and Google Now were previously accessible via a "swipe up" gesture from the home key, but now it also resides permanently as the furthest home screen on the left. In fact, its location resembles iOS 6's Spotlight; iOS 7 requires the user to "swipe down" on a home screen to access Spotlight. Google Now and Siri reside in different places, but they are more universally accessible. Google Now can be access as a home screen and by swiping up from the home key, but Android 4.4's "always listening" feature means its search functionality can be activated by saying "Ok Google," though this doesn't work while inside an app. Similarly, Siri has always been accessible anywhere by holding the home button. Google and Apple have decided their respective digital assistants and search should be at the centre of the OS - providing the user with a one-stop-shop for all information needs. It suggests voice search and predicted information are big parts of the future. Spotlight on iOS 6 used to reside on the left home screen (left). With GEL, Google Now and search are located to the very left as well (centre and right). Siri can be accessed anywhere by holding down the home button, not unlike the "swipe-up" gesture for accessing Google Now. Notice the transparent background and clean interface. Android is no longer a cluttered mess. Both it and iOS have fairly large visible icons and a friendly feel. The biggest similarity between the two is the use of transparencies. Though the Android colour pallet is much more monotone than Apple's cheery neon approach, transparencies have been used heavily to give the user a better sense of orientation. Both platforms' notification shades are transparent, though Android's resembles a blackout curtain while Apple's tends to blur out the background and allow colour to bleed through. The same is the case for iOS 7's "Control Center," which slides up below the dock. Google's search bar is very transparent as are the on-screen buttons, the latter of which have done away with the black background container. Also, the Android app drawer no longer has a black backdrop, and the wallpaper is universally visible except in settings. Fonts are also cleaner across the board on iOS and Android (Helvetica Neue on the former and Roboto on the latter). The iOS notification bar makes ample use of transparencies - allowing the colours of any given app to bleed through. Backgrounds are blurred out to reduce distraction. Android's notification shade includes less obvious transparencies. Instead of blurring the background images it increases the opacity, and as a result it looks more like a curtain. iOS is essentially an app drawer so the wallpaper is always present. The iOS 7 Control Center features the same transparencies as the notification menu. GEL has done away with the black app drawer background in Android. Now, the app drawer simply comes forward and uses the wallpaper as the backdrop. In no way am I suggesting Android and iOS 7 are the same. Any user of both platforms (myself included) can attest to this. However, I do believe the commonalities between the two are not a coincidence, and over time I suspect we'll see more design and feature convergence. It's just an example of the living language of design. Users vote with their wallets, and design decisions are business decisions. Companies are unlikely to depart from an approach that works for its users for fear that drastic change will alienate them. This approach also explains the variation in user expectations. Apple nailed the simple and elegant user experience out of the gate. As a result, there has been less pressure to rapidly change what works. Instead, it's refined iOS and focused on hardware, updates, power management, and (soon) the internet of things with iBeacon. Conversely, Android was kind of terrible out of the gate and I would argue this is its comparative advantage. Google has been incrementally improving the Android interface, albeit at a faster pace than Apple. While Android is still a little disorganized in areas - mainly the settings and file system - it's made great leaps forward and has settled on a very consistent layout. That being said, it's easier to impress when expectations are low. Today both platforms are generally on parody, and now that I've had a chance to use my iPad Air (running iOS 7) and Nexus 5 (Android 4.4 with GEL) I can say this is a fitting time for making comparisons. Some might wonder why I left Windows Phone 8 out of the equation. In short, it's not a big enough player in the mobile market. If Windows Phone captured a decent size of the market it would likely discredit my thesis, as it's design is a big departure. Being a distant third platform, there is a possibility that its design direction (and smaller ecosystem) has actually alienated users, thereby hindering its success. If Windows Phone adoption rates increase I will definitely have to re-examine my argument. There will continue to be UI advancements on both fronts, but it's likely the rate of change will slow. There is only so much content one can present on a mobile device's screen, and until we have flexible displays and holograms I don't see that changing. In the not too distant future, mobile devices will not be unlike their desktop and laptop counterparts - though the latter still continue to evolve - incrementally improving what works. The next puzzle for UI designers and developers to solve will be wearables. The differentiation in form factors will require these companion devices to have radically different UIs and functionality, which will no doubt lead to a wide variety of market players.